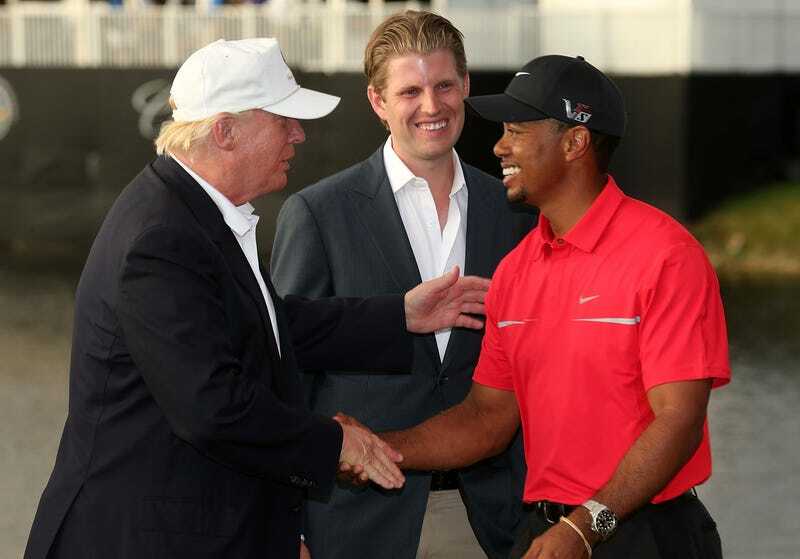 In this March 2013 photo, Donald Trump greets Tiger Woods after the final round of the World Golf Championships-Cadillac Championship as Eric Trump looks on at the Trump Doral Golf Resort & Spa in Doral, Fla.
Just one day after winning his fifth Masters Tournament championship in one of the greatest comebacks in golf history, Tiger Woods is set to receive another rare honor: the Presidential Medal of Freedom. “Well, I’ve known Donald for a number of years,” Woods said. “We’ve played golf together. We’ve had dinner together. I’ve known him pre-presidency and obviously during his presidency. While it’s a rare honor to be awarded with the nation’s highest civilian honor (only a dozen or less are awarded each year, according to the New York Times), it is rare that an athlete that is being honored receives one while still being active in his or her sport. But, in any case, if Trump’s tweet rings true, congrats are in order again for Tiger Woods.